Buckeyeskickbuttocks, MD Buckeye, CFPBuckeye and 2 others like this. I won't be hiring you for my next marketing campaign. Buckeyeskickbuttocks, MD Buckeye, OregonBuckeye and 1 other person like this. Double U + Double U + Double U = Sextuple U. Get it?! I’m just gonna show myself out now. Buckeyeskickbuttocks, TampaBuckeyes, LordJeffBuck and 4 others like this. jakenick06, brodybuck21 and CFPBuckeye like this. 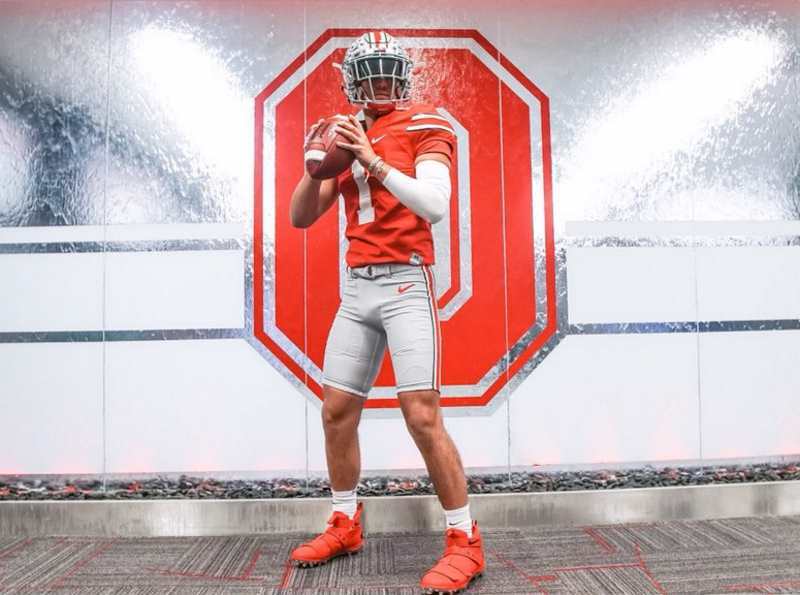 Has Ohio State Changed Its Quarterback Recruiting Strategy? No position in sports gets more attention than the quarterback in football. A great one can take an otherwise solid, but unspectacular team to a championship. A bad one can single-handedly lose a game or even sink a season. The starter becomes one of his team’s leaders almost by default. That can be true within a recruiting class as well. Often an early quarterback commitment will take a direct role recruiting other players in his class. That leadership role is one reason the position is unique in recruiting. As a result, while most schools will take multiple players at every other position in a class, virtually all will only take one quarterback. That has been the case for most of Urban Meyer’s tenure at Ohio State. The Buckeyes signed Cardale Jones in 2012, J.T. Barrett in 2013, Stephen Collier in 2014, Joe Burrow and Torrance Gibson in 2015, Dwayne Haskins in 2016, Tate Martell in 2017, and Matthew Baldwin in 2018. Gibson and Burrow in the 2015 class are the only exception, and Gibson moved to wide receiver within the first week or so of his freshman fall camp. However, after Burrow transferred to LSU this spring, the Buckeyes were left with just three scholarship quarterbacks for the fall. If everyone stays, and the Buckeyes sign a quarterback this December, they’ll be back to four for 2019. However, Haskins could theoretically leave early for the NFL Draft after this season, and injuries or transfers are always possible. Meyer has acknowledged that playing with only three scholarship signal-callers is not ideal. If any of those players leave, it could force Meyer to double up at quarterback in one of the coming years. It’s not his preference, but he has done it before. “We took Cam Newton and John Brantley one time,” Meyer said, referencing a pair of 5-star QB prospects he signed at Florida in 2007. The Buckeyes already have 4-star prospect Dwan Mathis committed for 2019, and 4-star Jack Miller locked in for 2020. Barring a major change, don’t expect any new names to join that list until 2021. The other question centers around the type of quarterbacks the Buckeyes are targeting. Heading into the 2019 recruiting cycle, the defensive tackle position wasn't viewed as a priority unit like the more needy wide receiver, defensive end, and offensive lines. This was thanks to a ridiculous 2018 haul that featured five-star Taron Vincent and a trio of four-star prospects in Tommy Togiai, Tyler Friday (who can man a number of spots), and JUCO standout Antwuan Jackson. We initially had speculated the the Buckeyes could potentially finish off the 2019 class without signing a single player at the position, though for the most part the projection has been for one tackle to sign with Ohio State in December or February. The Ohio State class checks in at No. 7 in America, and defensive tackle is the only non-special teams position that has yet to be addressed. We're now midway through the cycle and it's looking as though Larry Johnson and Co. could bring in a pair of interior linemen. New names continue to emerge and one of the staff's top targets recently was scratched when Missouri's Etinosa Reuben pledged to Clemson on Sunday. Right now there seems to be more questions than answers when it comes to Ohio State's 2019 defensive tackle recruiting. Some are questioning why a couple of four-star in-state prospects have garnered seemingly zero attention from the Buckeyes' staff. But who are we to interrogate someone who's been working with defensive linemen dating back to the year the original Mario Bros. was introduced to the world? Let's reset the board a bit and look at who remains in the picture, who the most likely options are, and how the Buckeyes may fare at the position between now and February's signing day. The country's No. 3 defensive tackle hails from the state of Hawaii and the Buckeyes are currently sitting in his top five. The problem is that they're probably closer to the five hole than the top of that list. Faatui Tuitele was in Columbus back in April, but right now it appears that Alabama may be the team to beat. Washington, Texas, and Clemson rounded out the top five, but it's tough to rule out the Trojans even though they didn't make the early cut. Right now this one is probably a pipe dream at best for the Buckeyes. I may just be catching up, but I noticed something new on the Scout recruiting site. If you go to the list of commitments and scroll to the bottom there is a list of "All-time" recruits for that school. This list is based entirely on the Scout ranking of each recruit and has nothing to do with their actual performance in college (as evidenced by Noah Spence and Sam Maldonado being OSU's 3rd and 6th best recruits respectively). Our number one? Terrelle Pryor. What is really encouraging is that 5 of our top 10 "all time" (as in since 2002) recruits are on this season's roster. brodybuck21, LitlBuck and LordJeffBuck like this. Ohio State’s roster for the 2018 season includes four players who graduated from Maryland high schools. All four of them could play huge roles for the Buckeyes this season. Dwayne Haskins, from the Bullis School in Potomac, could play the biggest role of any Ohio State player this season as the Buckeyes’ new starting quarterback. The redshirt sophomore has yet to start a game for the Buckeyes, but has demonstrated huge potential as a vertical passer in limited action – including leading the Buckeyes to a second-half comeback win at Michigan last season – and could break out as one of college football’s top quarterbacks this season. Chase Young, from DeMatha Catholic High School in Hyattsville, projects to potentially be the Buckeyes’ biggest breakout star on the defensive side of the ball. The top-rated recruit of Ohio State’s class of 2017, Young has all the tools to be a superstar defensive end, and the true sophomore is expected to pair up with Nick Bosa to form one of college football’s top tandems at the position this season. Isaiah Prince, from Eleanor Roosevelt High School in Greenbelt, is in line to be one of the Buckeyes’ top leaders this season. As a senior and third-year starter at right tackle, Prince – along with fellow third-year starter Michael Jordan – is expected to be a linchpin of the Buckeyes’ offensive line, and he’s among the top candidates to be a team captain this year, too. Keandre Jones, from Our Lady of Good Counsel High School in Olney, began fall camp taking first-team reps at weakside linebacker and is among the players competing for a starting role at that position, where the Buckeyes need new playmakers to step up. Ohio State has been aggressive in recruiting the state of Maryland in recent years, landing one of the state’s top two prospects for four straight years (Taron Vincent, who finished his high school football career at IMG Academy in Bradenton, Florida, is also a Maryland native), and those efforts could pay off in a big way this season. The Buckeyes’ recruiting efforts in Maryland aren’t new to the past four years – they pursued wide receivers Stefon Diggs in 2012 and Taivon Jacobs in 2013 before both ultimately decided to stay in their home state and attend the University of Maryland – but Prince started the trend of Maryland natives heading west to Columbus in 2015 (probably not coincidentally, the first full recruiting cycle for defensive line coach and area recruiter Larry Johnson, a former Maryland high school coach) when he chose the Buckeyes over the Terrapins and Alabama on National Signing Day. he Buckeyes are set to add at least one Maryland native again in 2019, as they already have a commitment from Bullis School safety Bryson Shaw for next year’s recruiting class, while they also remain a frontrunner for defensive tackle D’Von Ellies, from the McDonogh School – where Johnson was the head coach from 1975 to 1991 – in Owings Mills. Ohio State is also recruiting Maryland and the surrounding area aggressively for the class of 2020, emerging as an early frontrunner for Damascus High School defensive end Bryan Bresee – the No. 1 overall player in the entire class – as well as a trio of prospects from St. John’s College High School in nearby Washington, D.C. (linebacker Mekhail Sherman, wide receiver Rakim Jarrett and defensive tackle Tre Williams). With Haskins and Prince on offense and Young and Jones on defense, Ohio State’s lineups are set to have a huge Maryland presence in 2018. And the Buckeyes have already laid the groundwork for that to continue to be the case for at least the next several years to come. Great article to reflect on. From my early Buckeye recruitnik days, I was always frustrated that we could not seem to get any inroads into MD. That has drastically changed under UFM and LJ Sr., and it is easy to forget or take for granted how big they have been in recruiting the heck out of the east, particularly Maryland. Haskins, Young, Prince, K. Jones...the first 3 are going to be stars for us this year and Jones has massive potential heading into his junior year. Awesome to see us successfully recruit that area. I think the previous coaching staffs tried hard to get in those regions, but didn't have the in-roads like UFM and LJ Sr. Regardless, what a huge improvement in that area, has paid huge dividends. This rift between OSU administration and Meyer (to whatever degree it is real) just can't be good for recruiting, right? If I'm a competitor I'm telling kids the bad blood is going to result in him leaving town before the end of that contract type of thing. calibuck, buckeyebri, Buckeyeskickbuttocks and 2 others like this. On top of him being on record having an issue with how OSU handled Torrance Gibson. That being said, I don't see it being an issue. But any recruiter worth a darn will try to work that angle.